Hanukkah Harvie vs. Santa Claus: The Chrismukkah Kerfuffle is a children’s book of entwined beliefs, written by David Michael Slater and illustrated by Michelle Simpson. As Hanukkah Harvie starts to deliver gifts to Jewish families worldwide, the very last thing he anticipates is running into his arch-nemesis, Santa Claus. The moment they set eyes on each other, Harvie and Santa are determined to out-gift each other. The competition between them becomes vicious as they shower the homes of entwined faiths with a multitude of gifts while halfheartedly gifting those homes which follow just one faith. It takes the shining voice of reason to point out how foolishly they are behaving on a night which should be filled with joy. With both characters written and illustrated so exquisitely, I could not help but find sheer delight in a tale which has been so intricately woven by David Michael Slater. All too often, people around the world see different faiths as something to fight over. All of us find hope and peace in whichever faith we choose, and the world would be such an amazing place if this were to be incorporated into the real world also. Watching the scowls and anger brewing within Santa Claus and Hanukkah Harvie was quite disturbing, but also quite compelling reading. Children delight in both figures, and such hatred should never be born out of the love and trust children are raised with. With one trying to show himself as being better than the other, both ultimately brought out that which is sorrowful, sad and oppressive rather than adored and cherished. As a Pagan, I found it interesting to see parallels appear – not only in the tug-of-war for a child’s affections, but also in the constant battles and fighting worldwide which is brought about by one religion hating another. I hope that some day people can come to appreciate all of the differences amongst us as well as the similarities, and that we can learn to live together in harmony, just as Hanukkah Harvie and Santa realized before it was too late. 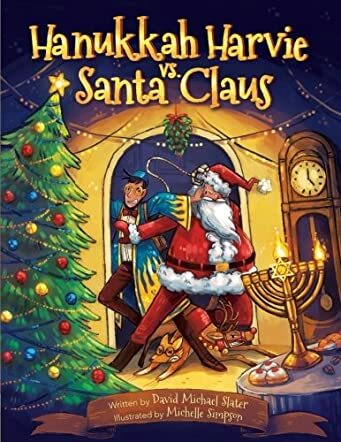 I very much enjoyed Hanukkah Harvie vs. Santa Claus: The Chrismukkah Kerfuffle and recommend it to all children, regardless of their faith, so that they might realize that some things are not worth fighting over.